Egg LDN, an electronic music venue and superclub based in London, presents Hollywood Forever Halloween show on November 1st at ON42 in the sublime surroundings of Media One Hotel. 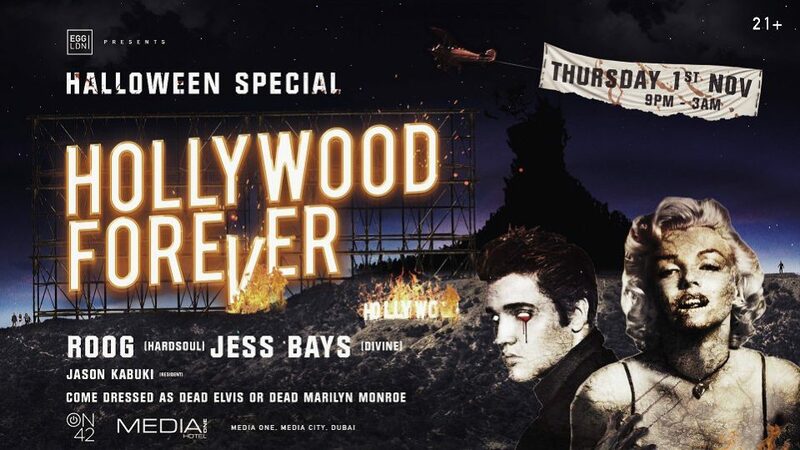 Guests of the show are invited to come dressed as a deceased Elvis, Marilyn Monroe or any other Halloween character. Special drinks and offers all night! Age limit: 21+. Holland’s own ROOG heads up the bill after establishing himself on the global soundscape since the 90’s with his signature style which incorporates 3 decks, seamless blending and a solid selection of chunky house music. A long running friend of Egg, Jess Bays joins ROOG with her infectious sound of house and tech house. Jason Kabuki completes the bill with his deep and soulful tones to warm us up for the night ahead.